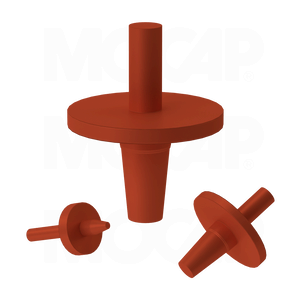 MOCAP Silicone Rubber Washer Plugs are stocked in many sizes to fit your specific application. Rubber plugs fit and protect threaded and non-threaded holes while the flanges mask the area around the holes. Silicone rubber product plugs withstand high temperatures to 600°F (316°C) and are safe for e-coating and powder coat systems. Also ideal for chrome plating. Reusable in many applications. MOCAP's line of rubber masking products includes EPDM and silicone rubber plugs and caps stocked in many sizes for immediate shipment.